On Monday, the UFC officially announced that champion Brock Lesnar will be granted his rematch against interim champ Frank Mir at UFC 98, with the winner leaving the Octagon as the UFC’s undisputed heavyweight title holder. The May 23rd event will be held at MGM Grand Garden Arena in Las Vegas, Nevada. 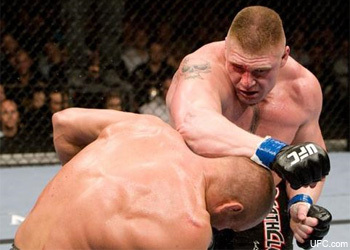 “Brock Lesnar and Frank Mir put on one of the most intense one round fights I’ve ever seen at UFC 81,” UFC president Dana White stated in a press release. “But when it was over, both guys saw things very differently. Lesnar blamed his loss on inexperience and being too aggressive, while Mir saw his win as a triumph of his technique, something he says will happen every time they fight. Although Mir knows that Lesnar has improved immensely as an all-around mixed martial artist, he is still light-years behind a fighter of his caliber. Tickets for the card will go on sale this Saturday at 10 AM EST/7 AM PST, with prices ranging from $75-$800.